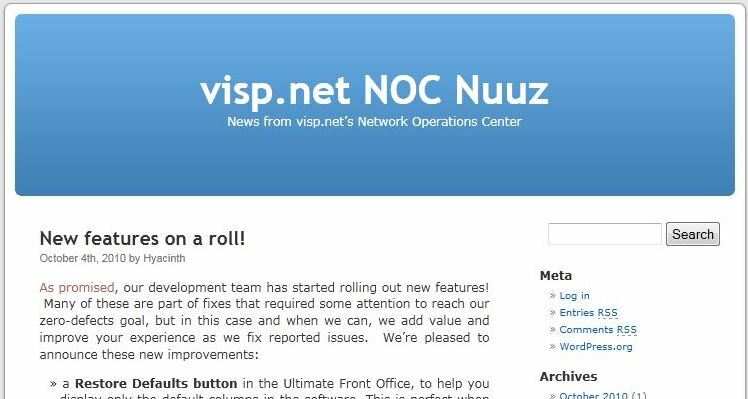 A great way to keep up with significant news on visp.net’s products and services is through the Visp.net NOC Nuuz (pronounced knock newz, http://nuuz.visp.net/wordpress/). It contains articles on new features and enhancements in the UBO software, as well as other informative updates for ISPs. NOC Nuuz is updated promptly with helpful descriptions, pictures, and links to keep you in the know. You can access NOC Nuuz through the software (go to Help on the menu bar, then click NOC Nuuz), as well as through the Support Site (under Administration).